Schindler’s List: test/essay questions/a Prezi. The CCSS “lay out a vision of what it means to be a literate person in the 21st century.” Integrating film into your curriculum is an excellent way to satisfy many of the new Common Core State Standards. You don’t need to show entire films, just short clips of these films, to develop competences deemed essential in the new CCSS guidelines. 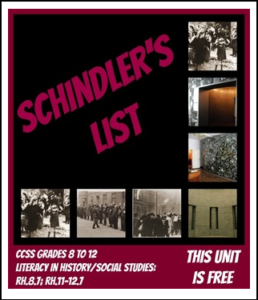 I teach SCHINDLER’S LIST as a TEXTURE TEXT or a CONTEXT TEXT usually alongside THE REPUBLIC. It is an excellent film to use when studying philosophical concepts including, but not limited to, the following: morality, ethics, sacrifice, freedom, courage, and the power of hope. What is Textual Analysis? Unit #2.